“I’m doing schoolwork,” I yell back. I am annoyed, but he has a reason to get angry at me for using the computer for so long. If I am on the computer it is likely that I am playing computer games. My parents, like many adults who grew up in the age of Pong and Pac-Man see video games as little more than colorful, noneducational ways to waste time. Even to many of the kids who play them, video games are just “fun.” What can we really gain from games? ‘You (failed to) win!’ the screen says, along with ‘Rooms traversed: 9’. Nine rooms! Three more than last time! So what if I (failed to) win? In middle school there is so much competition and pressure that it is often hard for a student to feel accomplished. Every achievement seems to be shot down (I really liked that essay. Why did I get a B-?) or made insignificant (Yes! I got 92%! What? Eddy got 96%?) In video games, pressure from parents, peers or teachers is almost nonexistent. Personal records can be set and broken, with no one judging every move. Many games are easy to improve at, and there are many types to suit any individual strength or interest. I’m on a metal slab island surrounded by stagnant green water. Walls rise high on my left and right to the ceiling of the cavernous room. High on the left wall a single light illuminates a metal door with a small platform beneath it. The exit. I review in my head my methodical reasoning for situations like these. Can I jump? Launch myself? Use a portal? Or my signature, stand on the orange swivel chair (despite what Officer Buckle taught me in preschool) that I have been carrying around for the past four test chambers? In Peter Lai’s classroom, a poster on the wall near the door lists the proper steps to use when solving a problem. Although I see the poster daily, I cannot recall what it says. Instead, I have made my own problem solving steps for video games, which I remember better than any technique I have learned in school. Most games involve solving mysteries or puzzles, which get easier to solve as techniques are discovered and refined. Skills used in games such as observation, anticipation, trial-and-error, and cause-and-effect thinking can be used in everyday life, but are much easier learned in game environments that kids find engaging. 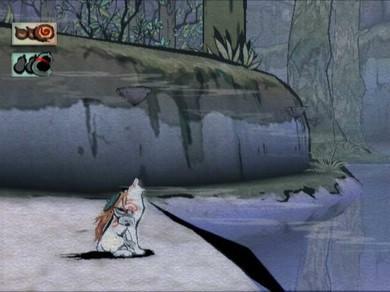 Okami, a game that combines loveable characters, unique gameplay and beautiful graphics. I am almost crying at the end of the two minute cut-scene. It is so happy. It is so sad. Joey is okay, but what about River? What will happen to Johnny? There are books, movies, and video games. Video games can be much like books and movies combined, with imagination mixed in. Games have the visual aspect of a movie and readable text from a book, but what may make them most appealing as stories is the aspect of choice. The player has the ability in a game to control partially what happens, which cannot be done with a book or movie, making games more engaging. Many games are RPGs, or Role Playing Games, meaning that the player controls the actions of a specific character in the game, making the player feel like they are part of the game. This also allows for character development that can sometimes be stronger than that in books or movies. Stories in games are different than those in books or movies, but no less interesting. They often combine adventures, mysteries and humor to create story lines that only work in the form of a game. I pick up a pot and walk into a small shop. The wooden door creeks behind me. The interior is dim and cluttered. As I walk around the shop, a man in a red robe watches me. I wonder how he turns around without moving his feet, and why he does not react when I jump on the counter. I go into third person mode and watch myself dance in my fancy armor, and knock over a pile of books. I throw the pot across the room. It hits a shelf, breaks, and knocks stuff all over the floor. I grab a chair as the shopkeeper yells and swing it at a table. A slab of meat flies across the room. I grab a random object (it turns out to be a wooden bowl) and run out of the shop. Halfway down the street a guard stops me. “Stop. You’ve violated the law,” he says as he shoves his face too close to mine. Aw, man. I got caught. I reload the game. Curiosity is natural for humans, especially young humans. But, because it killed the cat, (and could therefore probably hurt a human) and because actions are irreversible in the real world, curiosity often must be restrained. Video games give kids a place where they can be absolutely crazy, and do anything they want. Even dance on counters and steal wooden bowls. In games the characters can jump off cliffs, then respawn if they die. Games provide unconditional freedom, even from the restraints of humanity. Previous PostWriting is the Soul on PaperNext PostReady…Set…Time Warp!